Printronix P8000 / P7000 Cartridge Series of Line Matrix Printers provides competitive advantages. Through a series of engineering innovations, the P8000 / P7000 Series delivers improved reliability, productivity and environmental advantages. Click here if you need Spool Ribbons for your Printronix P7000 Line Printers. EMBEDDED MICROCHIP = Provides precise, integrated control over ribbon life, print quality and operating costs. Productivity is improved by preventing interruptions of long print runs. CARTRIDGE RIBBON DESIGN = With the self contained cartridge ribbon, changing ribbons is easier, cleaner and faster when compared to spool and laser printers. ENVIRONMENTAL ADVANTAGE = Line matrix consumables are greener than serial or laser printer consumables, and are able to print on papers and forms with a higher percentage of recycled content. 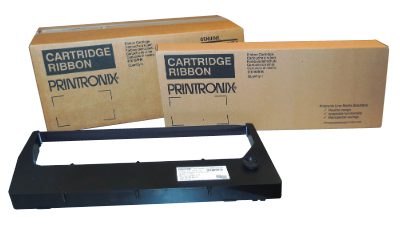 BACKWARDS COMPATIBILITY = Ribbon cartridges for the P8000 are backwards compatible with P7000 Cartridge printers for reduced inventory management cost and simplified ordering. Lowest cost per purchase for customers with a restrictive budget. Available in a single pack. This cartridge ribbon fits all P8000/P7000 Cartridge printer models. For customers seeking a lower operating cost per page. Available in a four pack for greatest cost savings. This cartridge ribbon fits all P8000/P7000 Cartridge models, except the 500 line per minute models.